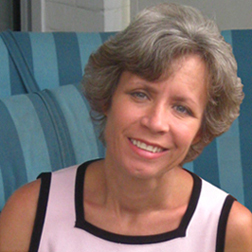 The Fat Quarter Shop is excited to welcome Sheri McCulley Seibold of Sheri Berry to the Jolly Jabber. 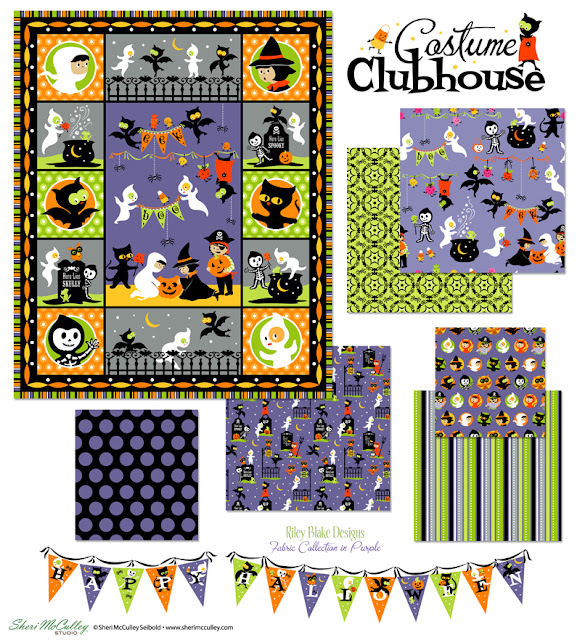 Sheri’s latest fabric collection is Costume Clubhouse from Riley Blake Designs. A: I don’t make up physical inspiration boards for collections, but my studio is filled with old products and bits of commercial art that inspire me. 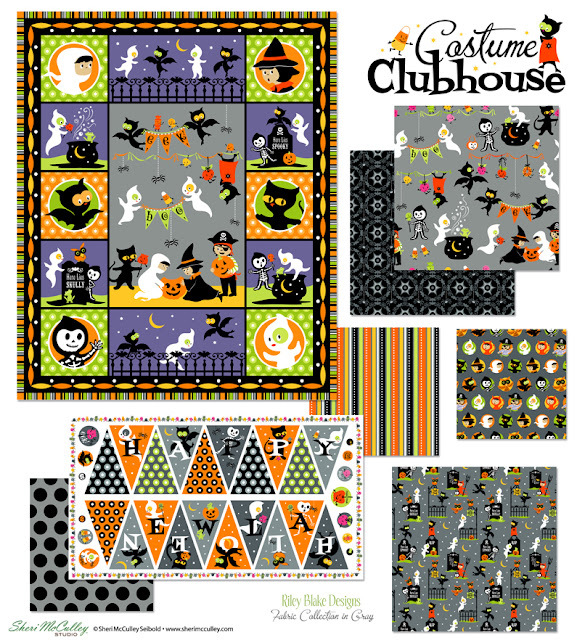 The feeling for these characters, which debuted in the earlier fabric collections called “Trick or Treat Street” and “Costume Club,” was inspired by classic animation like Casper the Friendly Ghost, Felix the Cat, and “The Great Pumpkin.” So I dedicate this collection to everyone who, like me, prefers their Halloween to be sweet and innocent—not scary. A: One of the panels in this collection is designed to create bunting or a hanging banner, that spells out “Happy Halloween” with a character on each pennant. 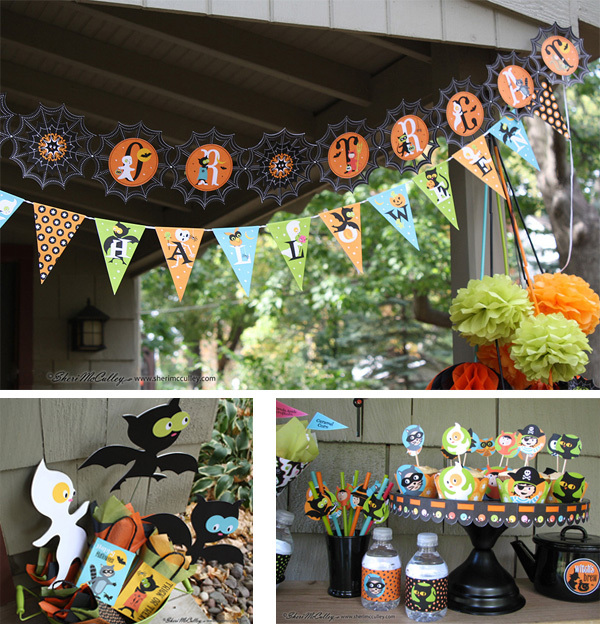 It can be used for seasonal decoration or actual party décor. In my earlier fabric collections with these characters, they were out trick or treating. In this series they’re inside the “Clubhouse” for a traditional Halloween party where kids dress up in classic costumes like a witch, a skeleton, and a pirate, and play traditional games like bob for apples. In fact, I created Costume Clubhouse paper crafting collections for Lettering Delights that play on these same themes, with games and decorations that coordinate with all these fabrics. A: As they say in “Back to the Future,” I’d love to be “safe and sound back in good old 1955.” Actually, I love the styles of everything in America from about 1945 to about 1965— all of which was fading right around the time I came on the scene. A: If I HAD to change my first name, I’d probably go with “Stephanie,” my best friend from childhood. A: I always loved “Bewitched,” especially the opening titles that had Samantha and Darren as cartoons flying around on a broom, complete with sparkly stars and swirls of stardust against a romantic night-time sky. I hope people get the same feeling of fun and romance from Costume Clubhouse and the two collections with the same characters before it. A: Martha Stewart is probably the most current celebrity I’ve met. However, as a grade-schooler I met then-vice-president Gerald Ford, and our picture was in the paper. And when we lived in a small town in Michigan in the late 1980s we would occasionally bump into Muhammad Ali, who had a home nearby. A: In order to keep up the pace of art production I need to keep my licensees cranking out products, I leave the smart-phone apps to my kids and focus on the main programs on my Mac: Illustrator and Photoshop. My cell phone is not too smart, and its main use is rather unconventional these days: Calling people and talking to them. A: When it comes to technology, I’m rather Amish at heart. But I actually did “marry technology” in the form of a husband who works in the tech field and we now have two tech-minded kids. If I didn’t need a computer to create my designs, I’d be happy to go back to an era where the technology centered around light switches, running water, and rotary phones.